Laurens Sweeck (ERA-Circus) and Kaitlin Keough (Cannondale pb CyclocrossWorld) powered to wins during the UCI C1 event on the opening day of the three-day Jingle Cross Festival. Laurens Sweeck (ERA-Circus) captured the win Friday in the men’s race on the opening night of the three-day Jingle Cross Festival, taking advantage of the absence of two-time world champion Wout van Aert (Crelan-Charles) and former world champion Mathieu van der Poel (Beobank-Corendon). The racing took place under the lights on Friday night and despite being a UCI C1 event, many riders opted to rest their legs in preparation of Sunday’s world cup race. However, many of the Americans were seen on the startline. The course on Friday was hot and dusty with riders consistently turning in laps under six minutes. A lead selection of Laurens Sweeck (ERA-Circus), Quinten Hermans (Telenet Fidea) and Michael Boros (Pauwels Sauzen Vastgoedservice) broke free from the rest of the field early in the race when the other riders could not match their blistering pace. Five laps into the race, Sweeck got a gap on Hermans on the technical back half of the course and then turned it into a lead he would not relinquish by powering through the long finishing straight. Hermans eventually broke free from Boros and finished second, and Lars van der Haar (Telenet Fidea) recovered from a slow start to finish third. National champion Stephen Hyde (Cannondale p/b CyclocrossWorld) was the best American of the night, coming in eighth place. “It hurt,” Hyde said after the hour-long effort. “It feels good though for the second race weekend of the year. The level of racing here is just so high, it’s really good. I’m really happy with my early-season form. I was real sick a few weeks ago, so I didn’t think I’d be anywhere near where I am right now, so I’m really happy. 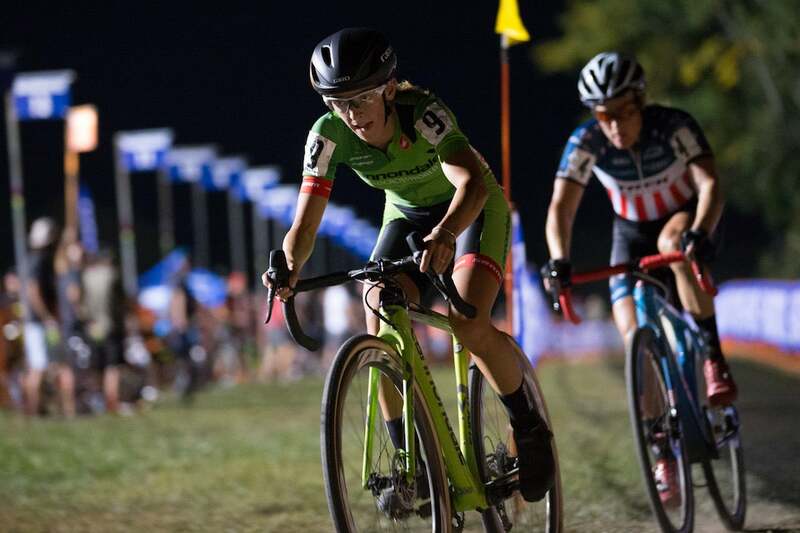 In women’s action, Kaitlin Keough (fomerly Antonneau) of the Cannondale p/b CyclocrossWorld team bested 13-time U.S national champion Katie Compton, as the duo dueled for most of the race. Compton, winner of the 2016 Jingle Cross World Cup, and Ellen Van Loy (Telenet Fidea) charged off the line in an effort to lead the 43-strong field up the infamous Mt. Krumpit run-up. However, Brit Nikki Brammeier (Boels-Dolmans) squeezed by before the flyover to lead up the steep, rutted climb. Keough set about granting her own wish after a crowded first lap. She soon connected with Compton and drew out Canadian National Champion Maghalie Rochette (Clif Bar) to put pressure on the rest of the field. Keough hit the front with Compton, and within a lap the two dropped Rochette. Ellen Noble (Aspire) and Rochette took up the chase, and behind them, two Europeans, French National Champion Mani, who finished second at the 2016 Jingle Cross World Cup, and Helen Wyman (Kona) were roaring back. Keough and Compton traded turns at the front, opening up their gap over the others as each of the seven laps went by, leaving the others to fight for third. As the end drew closer, Keough believed her best chance for the win was for it to come down to a sprint, but wanted to avoid Compton opening up a gap on the descent. “I tried to lead going into [the run-up], and then I noticed I had a little gap, I wasn’t really trying to attack,” Keough explained. Intentional or not, it felt like an attack to an at-the-limit Compton. “She attacked going over the run-up, and then I had trouble in the sand,” Compton explained. “I kind of got off line and lost a bit of time there. While the Keough and Compton battled for the win, behind, there was a suspenseful battle for third. While Noble and Brammeier faded, Mani and Wyman surged forward. Keough rolled home in front of her Midwest fans, with a big boost of confidence heading into Sunday’s World Cup. Mani rounded out the podium in third. The three-day Jingle Cross Festival continues Saturday night at the Johnson County Fairgrounds. Saturday night’s race is a UCI C2 event and many riders are expected to rest ahead of Sunday’s World Cup. The Telenet UCI World Cup race is Sunday afternoon. The women start at 3:00 p.m. Eastern and the men at 4:30 p.m. Eastern.